Having been left completely deaf in one ear and hard of hearing in another, Richard Orcheret struggled to keep up with his fellow students, but after receiving his first pair of hearing aids his life turned around in exciting and dramatic ways. Read on to find out more! At ten years old, about 73 years ago, Richard Orcheret developed a mastoid infection. A mastoid infection can cause serious hearing issues, and today antibiotics or surgery are both options. Richard tells us that in 1937 the standard procedure was to operate. The surgery left him completely deaf in his right ear and “increasingly hard of hearing” in his left ear. With both ears compromised, he struggled to keep up with his fellow students socially and in the classroom. This continued all through junior high and into high school. In 1943 when Richard reached the age of 16, his parents bought him his first hearing aid, which used subminiature tubes. 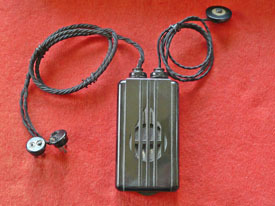 That early model might have looked similar to this 1940’s Beltone found at the On-line Hearing Aid Museum. He describes the hearing aid as “big and clumsy”, but adds, with obvious joy, “It changed my life.” For the first time in six years he could hear normal conversations. He could listen to the music he loved. He was able to enjoy the catchy and fast music of the day, like the JITTERBUG along with his peers. School became “a breeze” for Richard and he graduated college with honors at the age of nineteen! Shortly after graduation, Richard began a career which lasted for sixty-three years, up until the day he retired. He credits his hearing aids with allowing him to go from feeling shy and reclusive to being able to engage with others as equals. He was able to communicate with and meet his wife. They were married shortly after, and have been married ever since. The advances in technology have certainly come a long way, and they continue to make improvements that will benefit those with hearing loss. Thank you for sharing your story, Richard. Your commitment to your hearing health is admirable. Thanks to people like you others can become inspired to make changes for the betterment of their hearing and their lives!